« Day 224 in Beijing: Hairstyle Academy. Day 225 in Beijing: Uh, Does This Really Need To Be Stated? I would think some of these would be automatic but I guess I’d be wrong. People in Malaysia seem to have love their cars almost as much as Californians. They trick them out, give them spoilers and love the fast little speedsters that are tuned up and can be raced on the street. They also seem to like putting stickers on their windows of what they approve of inside their cars. In America, people seem to like putting up stickers of how many kids they have, their dogs and whatnot. They are little “stick figure” type stickers and it seems to make people feel as if they are a “family” and connected. Or maybe they do it so they won’t forget one of their kids when they drive off from a movie. I don’t really know why they do it since I don’t have kids and am not a big fan of putting any type of advertisement on my car. I don’t have a car in Beijing, so it isn’t like I’m making a radical statement here but I almost never put bumper stickers or identifying stickers on my car. I did have a bumper sticker for a presidential candidate about 6 years ago but took that off pretty quickly. If someone wants to know who I vote for, or even if I vote, then ask me. I don’t need to parade it around. Plus, why antagonize people that may have voted for someone else and forego a chance of meeting a new person and hearing a new viewpoint? 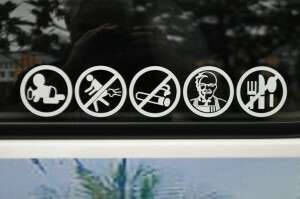 This was a sticker set I found on a minivan on our way to a see a mosque. It was a minivan that was used for tours and tourists. 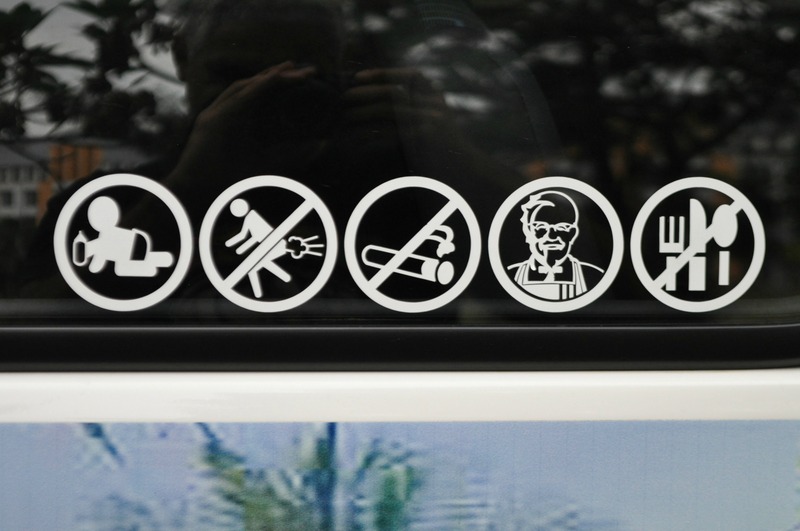 I had no idea that Colonel Sanders of Kentucky Friend Chicken would be appropriate in a tour van but forks, spoons and knives would not. Farting, on the other hand, I think does not need to be stated but, obviously, it does.